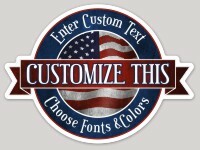 Share your patriotic sentiments on bumperstickers from MakeStickers. Elections to current events, we've got lots of great sticker templates online to help you express your feelings about America – with plenty of flag and other patriotic sticker designs. Simply click on a template and customize with your own text and color choices. MakeStickers.com also has templates that let you to upload a picture or logo. If you have designed your own bumper sticker, you can upload your file to our website and we’ll print it for you. There is NO MINIMUM QUANTITY on our bumper stickers, so you can order just one. Add to that an option for FREE SHIPPING on sticker orders, and you have free speech at its best! 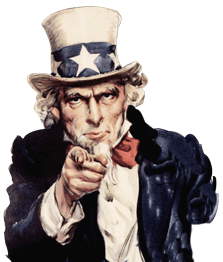 We have plenty more great American patriotic bumper stickers in our template categories.